The problem is not that the article is offensive (which it is). The problem is that it is empirically and historically inaccurate, misuses existing postcolonial scholarship, and largely ignores interdisciplinary approaches to the study of colonial legacies. There are at least five blatant examples of this.First, in the introduction, Gilley cites Berney Sèbe’s article that analyzes imperial figures in Zambian, Nigerian, and Congolese history, and advocates for replacing the “good governance” agenda with a “colonial agenda.” Sèbe’s research is essentially about the role of colonial history in the creation of Zambia’s, Nigeria’s, and the Congo’s state narratives where the state is still grappling with the scars of its colonial past. Sèbe notes that the rebirth of colonial leaders as heroes uncovers the profound effect of colonialism on the state’s nation-building narratives. 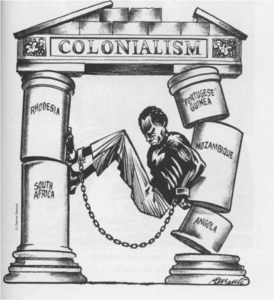 He further concludes that these narratives are moving from the post-colonialism calls of political emancipation toward “a post-racial form of cosmopolitan nation-building,” which attempts to combine anti-colonial sentiments with the modern conceptions of nationhood within African countries that are complex and multi-layered. Gilley conveniently ignores the latter part of Sèbe’s research, and instead, only focuses on this resurgence of colonial heroes as evidence of the failure of anti-colonial rhetoric. Handpicking arguments that fit into your own theory is bad methodology—and as a professor, Gilley should know better. Second, Gilley praises Sèbe’s “cosmopolitan nation-building” as an “explicit rejection of the parochial myth of self-governing capacity that drove most postcolonial countries into the ground” (p.8). Gilley has not only misused Sèbe’s term but clearly has also misunderstood it. Sèbe’s use of “cosmopolitan” is descriptive. According to the Merriam-Webster dictionary, cosmopolitan means “having worldwide rather than limited or provincial scope.” It does not, as Gilley concludes, reject the “myth” around postcolonial states governing capacity. There is ample historical evidence on how almost all postcolonial states inherited bureaucracies that they could not immediately manage. The lack of management was not because they did not know how to govern but was due to a myriad of factors that involved dealing with scarce resources, an influx of refugees, internal ideological divisions, and external threats to territory, as examined by Ayesha Jalal and Bertrand Badie. Gilley’s characterization of Sèbe’s “cosmopolitan nation-building,” therefore, is misleading and blatantly ignores postcolonial scholarship. Fourth, Gilley describes anti-colonial literature’s emphasis on the harmful effects of colonization as biased, inadequate, and not thorough enough. However, he ignores how disproportionate the benefits of colonialism were toward colonized populations. It is true that during their colonial rule, the British, French, Portuguese, Spanish, and Dutch built railways, expanded education systems, improved healthcare, created systems of taxation, and outlined basic governance infrastructure. And so Gilley states that a colonial governance agenda “resurrects the universalism of the liberal peace and with it a shared standard of what a well-governed country looks like” (p. 8). He uses Alexander De Juan and Jan Henryk Pierskalla’s article to make this point against anti-colonial critiques. De Juan and Pierskalla’s article, however, does not advance a pro-colonial agenda. Instead, it is a literature review showcasing four areas for growth within interdisciplinary postcolonial scholarship that include internal dynamics of colonial rule, disaggregating variables and units of analyses, and investigating contexts that shaped the consequences of colonial rule. Furthermore, advancements under colonial rule were not for everyone; not only did these measures favor elites and pro-colonizer groups but also created divisions along ethnic, religious, and linguistic lines within indigenous populations that continue to exist today. The colonial method of governance, therefore, was to oppress, violate, and divide resources and populations—and is thoroughly documented and researched within political science, sociology, anthropology, and history. For example, the British exploited differences between the Hindu and Muslim communities in the sub-continent, creating deep resentments and divisions that persist today due to the 1947 Partition. Similarly, differences between the Hutus and Tutsis that led to the Rwandan genocide were created and exploited by Belgian colonizers. Historians and anthropologists alike have argued that these differences were economic, not ethnic. In fact, Hutus and Tutsis are indistinguishable. Since the genocide, Rwanda has become a “beacon of hope,” and exemplifies how reconciliation can eliminate differences imposed by colonialism. And fifth, Gilley attributes the abolition of slave-trading to colonialism, which in addition to being ridiculous, is factually incorrect. The Portuguese began slavery in the 1500s as they explored West Africa while the British brought the first installment of African slaves to Virginia in 1619. Colonizers, therefore, created the slave trade. Systematic decolonization and subsequent wars of independence eventually ended the slave trade. Academia has a duty to inform with integrity, honesty, and evidence. If scholars and journals alike are not held to this standard, it provides an opening for falsehoods and misinformation to take hold, shape perceptions, and dictate policies. We are living in a critical political climate, especially in the United States, where President Trump’s apparent sympathy for radical right-wing groups is troubling. This kind of scholarship is dangerous not just because it legitimizes the whitewashing of academic literature but also stands to undermine U.S. foreign policy as it taints important scholarship on concepts related to neocolonialism. Aside from being wrong on the facts, articles like these merely perpetuate dubious justifications for U.S. military interventionism and long-term nation-building projects in distant lands with populations that resent foreign occupation. We should expect more from scholarly journals. If your going too pick apart someone else’s work, you should probably have your facts right as well. The slave trade was going on long before Europe decided too colonize Africa. By everybody’s favorite people the Muslims and yes Africa’s them selves had a big part in the slave trade going around catching their own people too be sold off as slaves for a quick buck. It was around the time America put an end too the slave trade, the West did go around around the world too put an end too the slave trade, and they almost had it beat. Except for the middle East which too this day still has open slave markets but ya nobody wants too talk about that eh. You are utterly an idiot! Isn’t your reply also picking apart this authors work? By the way, it’s to not too. Name calling is simply not productive or respectable.